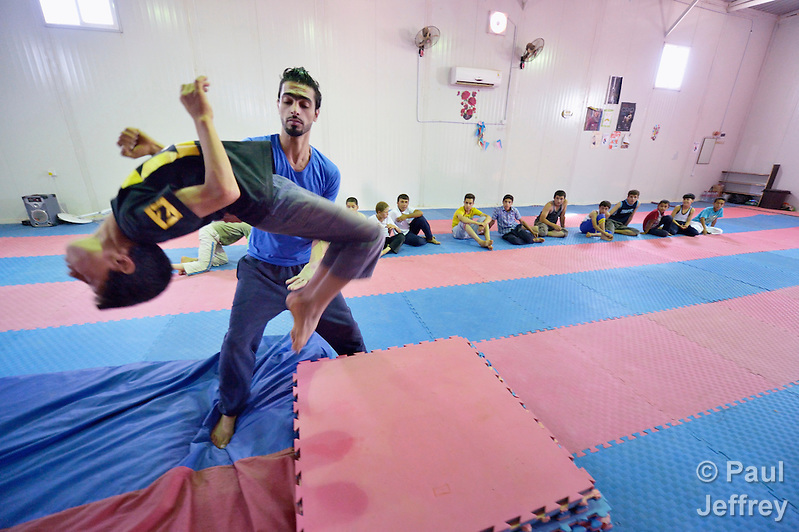 At the 2016 Olympics in Rio, a unique team of ten refugees participated for the first time in international competition. Their participation clearly showed that bravery knows no borders. To honor their participation and the struggle of refugees and displaced people around the world to survive and prosper, every day during the Olympics I posted an image on my social media accounts (Facebook, Twitter, Instagram) with the hashtag #teamrefugees imposed on the photo. Here are those 17 images, all in one place. 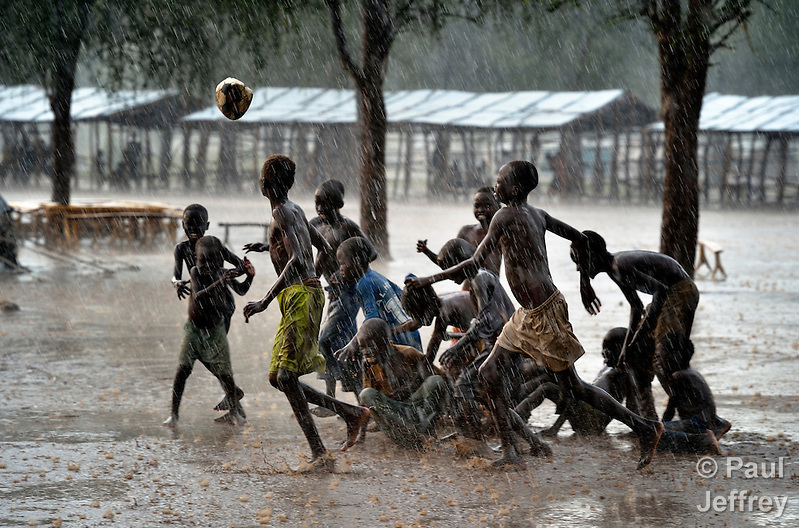 Refugee children from Sudan’s Blue Nile region play football in a camp inside South Sudan. 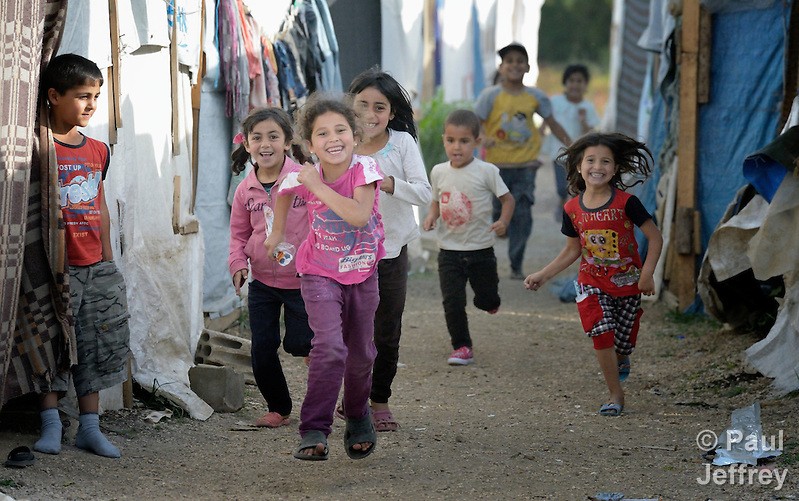 Syrian refugee children running in a refugee camp in Minyara, Lebanon. 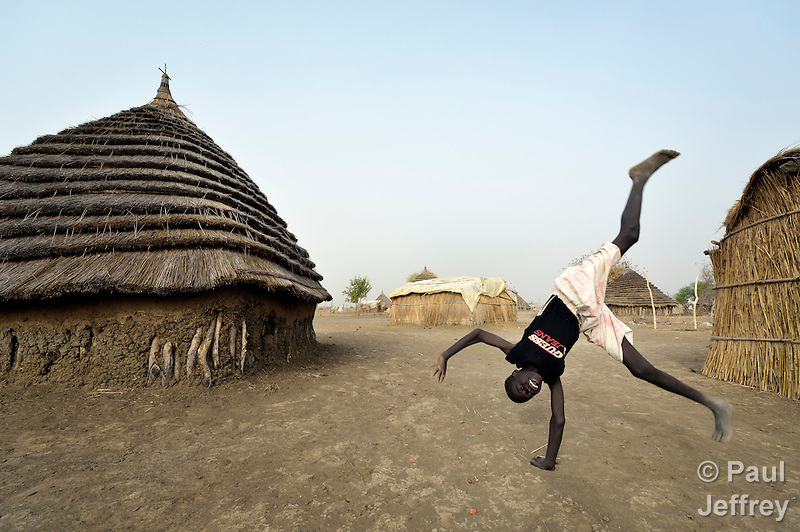 A boy displaced by military attacks on Abyei, the contested border region between Sudan and South Sudan, does a handstand in the displaced settlement in Agok. Refugees paddle across the Aegean Sea on their way from Turkey to Greece. They landed on the island of Lesbos. 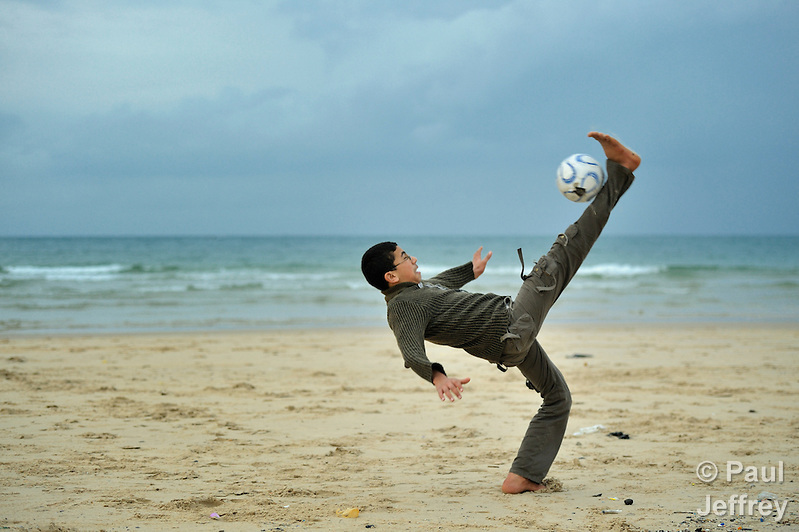 A boy on the beach in Gaza, where 1.25 million Palestinians refugees live, more than half a million of them crowded into eight recognized camps that have one of the highest population densities in the world. 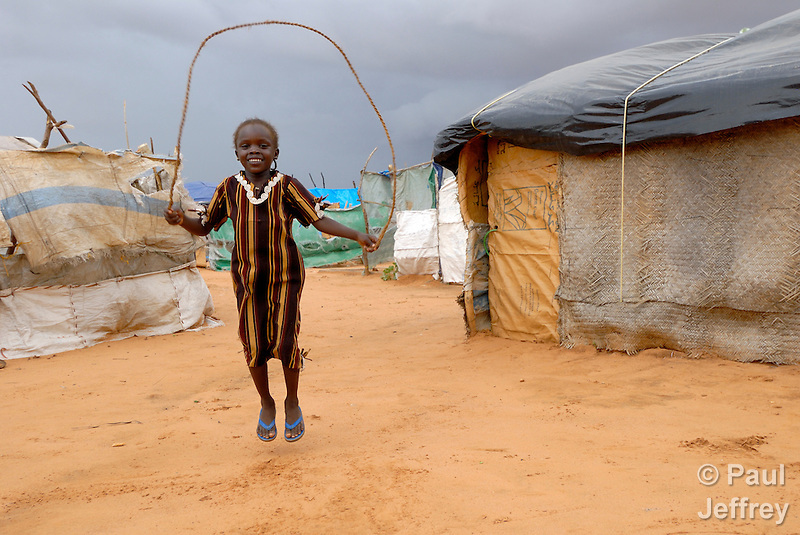 A girl skips rope in the Dereig camp for displaced families in the Darfur region of Sudan. 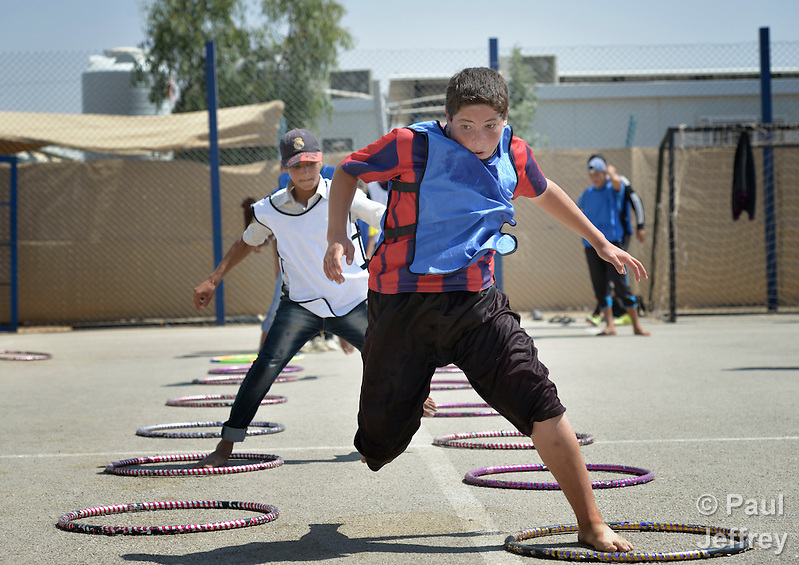 Syrian children exercise as part of a psycho-social program in the Zaatari Refugee Camp in Jordan. 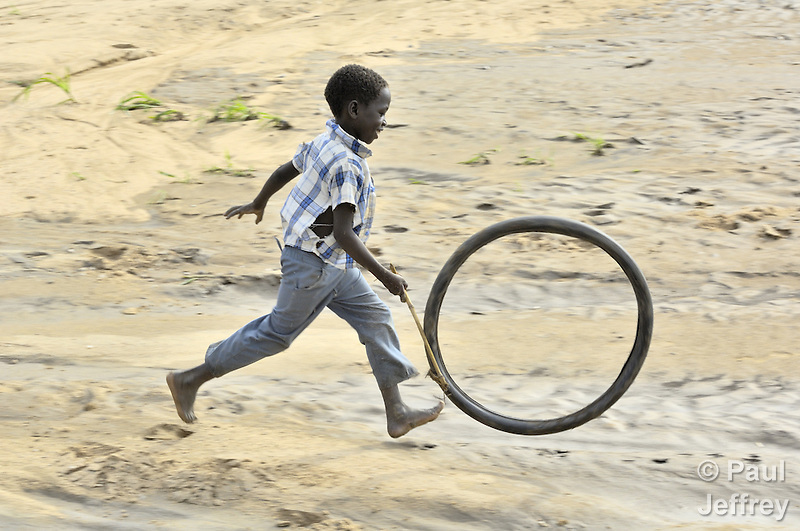 A boy plays volleyball inside a camp for internally displaced families in Yei, South Sudan. The country has been torn by violence since 2013 when a political dispute within the country’s ruling party quickly fractured the young nation along ethnic and tribal lines. 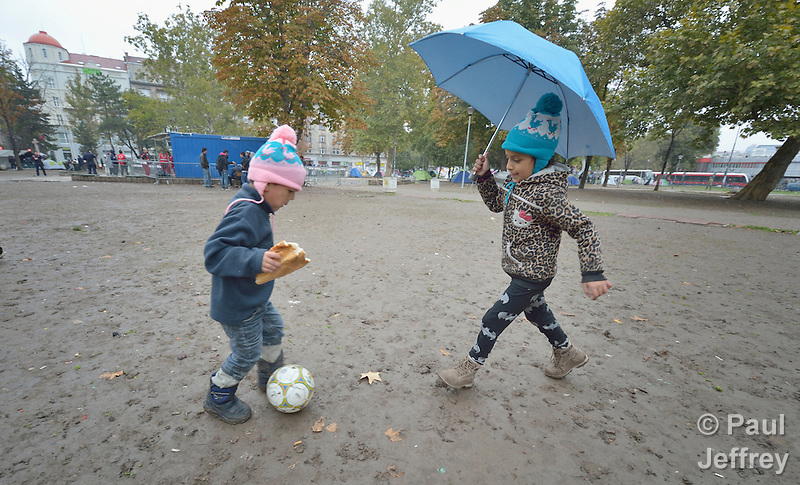 Four-year old Mashad kicks the ball to his 7-year old sister, Farah, in a city park in Belgrade, Serbia. They are refugees from Syria, and with their family fled that nation for western Europe. 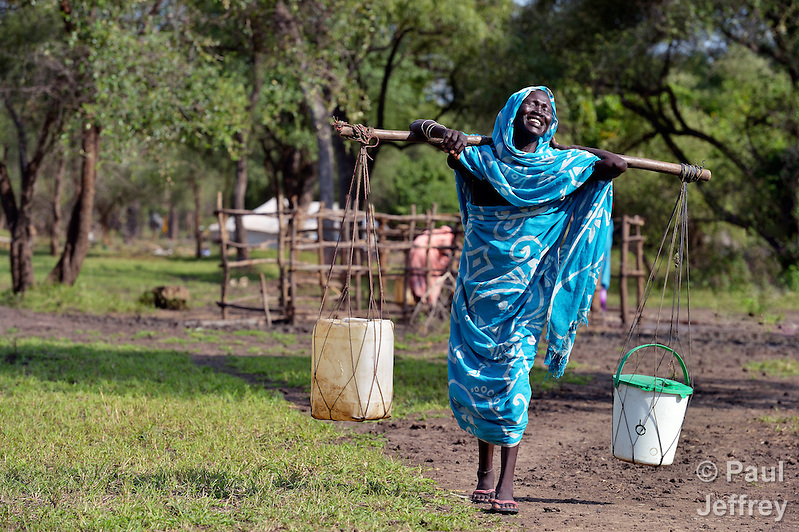 A woman who fled brutal government bombing in Sudan’s Blue Nile area carries water through the Gendrassa refugee camp inside South Sudan. 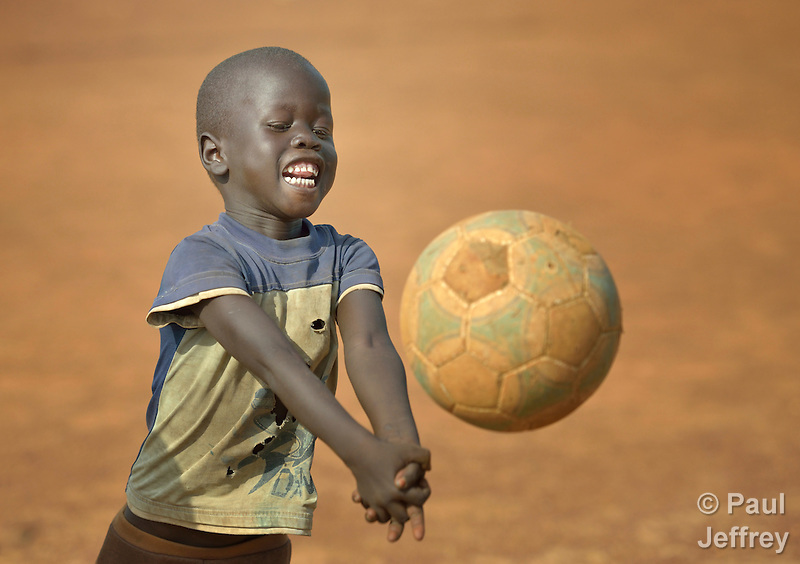 A boy plays in a camp for internally displaced people outside Um Labassa in Sudan’s Darfur region. We use the term “internally displaced people” for people who have had to flee their homes but haven’t crossed an international border. They share a lot in common with refugees, and often times are worse off because they lack the legal status of recognized refugees. 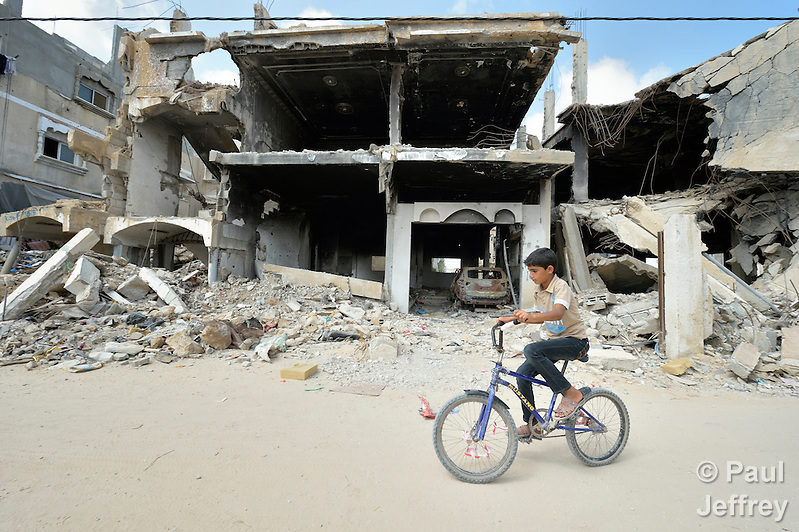 An 11-year old boy rides his bike amid the ruins of Khan Yunis, Gaza. Houses in the neighborhood were destroyed by Israeli air strikes in 2014, forcing tens of thousands of Gaza residents, many of them already refugees for decades, to flee for “relatively” safer areas. 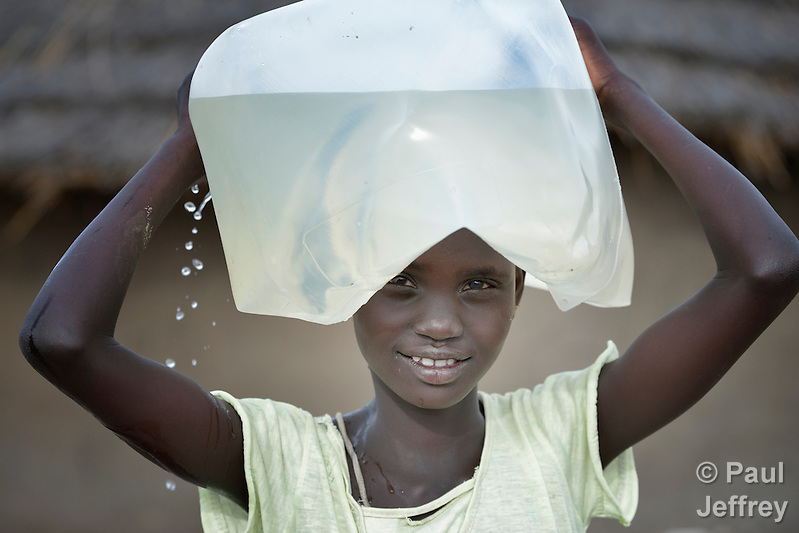 Ajay Galuak Akoy, 10, carries water in Bor, a city in South Sudan that was the scene of fierce fighting in late 2013 and early 2014 between the country’s military and anti-government rebels. Control of the town changed hands four times in a few weeks. Akoy’s family was repeatedly displaced by the fighting. Yanira Lopez walks her daughter Melany home from school in Texas. When drug traffickers began threatening her children in Guatemala, Lopez escaped with three kids and journeyed northward through Mexico to the United States, where she has requested political asylum. 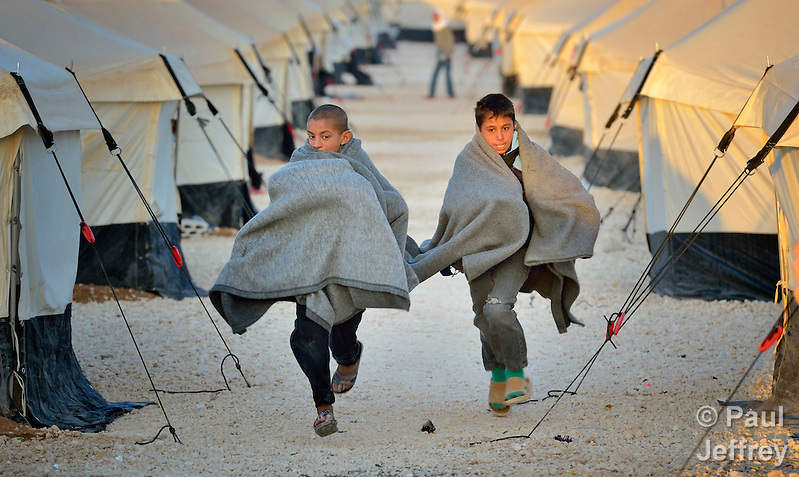 Two Syrian boys race through rows of tents early one morning in the huge Zaatari Refugee Camp in Jordan. 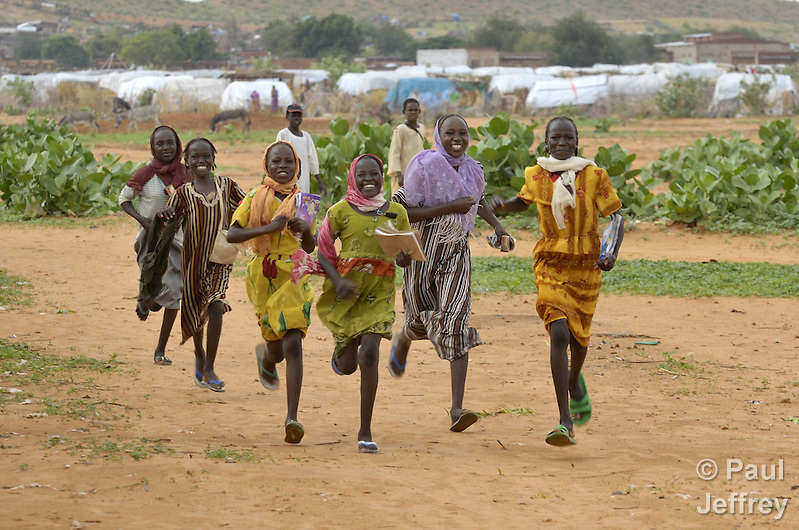 Girls hurry to school in the Dereig Camp for internally displaced persons in the Darfur region of Sudan. IDPs are also refugees, but haven’t crossed an international border, and so lack much of the legal protection and humanitarian assistance available to refugees. What I love about this final image is how it captures the excitement of girls to receive an education in a culture and context that have often make that difficult, if not impossible. This desire to survive and succeed is what characterizes the struggle of refugees and displaced people everywhere, and why so many found #TeamRefugees to be such an inspiration. May you all run and not grow weary. August 21, 2016 | Filed under Africa, Americas, Blog, Children, Disasters, Europe, Refugees, War.